This NCAER study examines the issue of credit penetration, its impact on the performance of agro-processing cooperatives, and the role of the National Cooperative Development Cooperation (NCDC) in facilitating cooperative activities through its financial and logistical support. The bulk of the subsidy in agriculture in India goes to farmers for pre-harvest operations and hardly there is any subsidy available for post-harvest operations like storage, marketing and processing of agricultural produce, which is the crucial forward linkage of the agricultural sector. It is also important to provide assistance, interest subvention and subsidies to the cooperative sector engaged in post-harvest operations for the benefit of farmers at the grassroots level. Boosting post-harvest operations in the cooperative sector could prevent the losses being suffered by farmers. 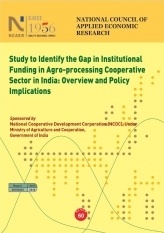 The study investigates the possible gaps in institutional funding to NCDC that might reduce its effectiveness in supporting agro-processing cooperatives in India.